Laugh, be inspired...and tap into your vast human potential. Good humor has the uncanny ability to break down barriers. 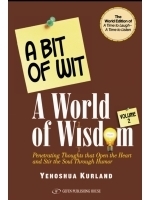 This collection of over fifty essays by master educator Yehoshua Kurland is a unique combination of laughter and lessons, of humor and heartfelt advice. These easy-to-read essays cover topics such as change, freedom, peace, inner struggle, and our relationships with others and with God. For anyone interested in personal growth, this self-help book offers an invaluable opportunity. The chosen format that combines a humorous story with an insightful lesson is one that helps to open our minds and hearts and leads us to contemplate our course in life – to actualize the vast potential possessed by every human being. It is often difficult to penetrate our hearts or to touch our souls, given the many protective walls we build. A good joke provides insight and creates an atmosphere of comfort that eases tension and opens the heart. A light matter, a bit of laughter, a smile brought to one’s lips – can lead to an important lesson for eternity.